Local craft brewery Brewshed has moved to new premises at Place Farm in Ingham. 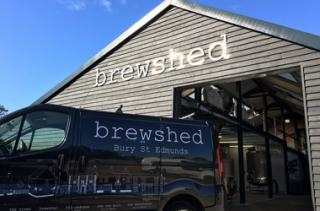 Brewshed has brewed in a shed in the grounds of The Beerhouse in Bury St Edmunds since 2011 with a 5 barrel brewery, supplying its sister pubs and other customers. In 2013, Brewshed began supplying Hotel Chocolat with bottled dark cocoa beer and in 2015 bottled pale cocoa beer was added to the Hotel Chocolat range. Demand for Brewshed beer has continued to increase and earlier this year the decision was made to move the brewery to a ‘newshed’. Brewing began at the shiny new 12 barrel brewery last Friday enabling the production of almost 3,500 pints per brew. David Marjoram of Brewshed said ‘We’ve had an amazing time developing Brewshed over the past 5 years and can’t wait to scale up production in our ‘newshed’’. Brewshed brews pale ale, best bitter and american blonde as well as other seasonal ales. You can drink Brewshed beer in its sister pubs - The One Bull in Bury St Edmunds, The Cadogan in Ingham, The Beerhouse in Bury St Edmunds and The Crown in Hartest. The brewery and pubs are part of Gusto Pronto Ltd, a totally independent, family run company owned by David & Roxane Marjoram.